Benjamin Barrone is a Finance and Accounting Professional located in Chicago, IL. Mr. Barrone recently helped Vital Proteins, a Chicago-based startup, secure a Series A financing round. Recently, Benjamin (Ben) Barrone has became interested in brewing great coffee. Here are some tips and tricks Ben has found to start your day off right with an excellent cup. Next, freshness of the roasted coffee beans is of the utmost importance. It is ideal to brew your coffee within one week of roasting. However, if that is not possible – the fresher the better. Mr. Barrone recently began ordering from a subscription service such as Craft Coffee (https://www.craftcoffee.com). However, Ben also likes to purchase freshly ground coffee at local Chicago roasters such as Intelligentsia (https://www.intelligentsiacoffee.com) and Dark Matter (https://www.darkmattercoffee.com). Brewing strength is a matter of personal taste. Generally, sticking to a water-to-coffee ratio of 15:1 to 18:1 will yield good results. Benjamin Barrone’s preference is 16:1. Step One: Heat the water in your 1.2 liter kettle and bring to a boil. Step Two: Grind your coffee with a burr grinder and determine how much coffee you’ll use based on how many cups of coffee you’re making. For a full container (on the eight cup model), try starting with 4 coffee scoops and adjust as necessary. Step Three: Place a filter in your Chemex (with the three layer side of the filter facing the spout) and pour a little hot water to wet the filter. This warms the glass and removes any paper taste from the filter. Dump out this water. Note: because you just used water from your kettle, you’ll have less than 40 ounces to brew. If you’d like, you can fill the kettle back up and bring to a quick boil again. Or, you’ll have just slightly less coffee if you don’t refill. Step Four: Add your coffee grounds onto the pre-moistened filter. Step Five: Pour just enough water to fully saturate the grounds and let the coffee expand and bloom for 30-45 seconds. Step Six: Pour your water in a slow, circular fashion until you’ve filled the top nearly full (about a half inch below the top). 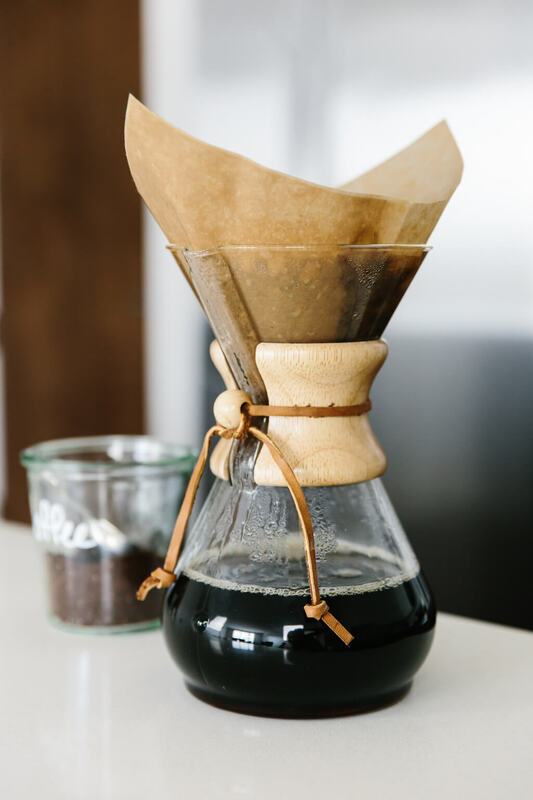 As the water starts to drain, continue adding more water until your kettle is empty (if you’re using an eight cup Chemex), or until you’ve reached just below the wood handle. Step Seven: Once your Chemex is full, remove the filter and grounds and enjoy your freshly brewed cup of coffee.